I hope that all of you had a great weekend (which if you’re lucky enough to have today off is still going!) as well as a wonderful Valentine’s Day. We’re not fanatics about the day around here, but I did make a big dinner on Saturday night and these cookies for dessert so I guess you could say we celebrated! I hadn’t planned on making a dessert, but I saw this painting technique on a leather bag this week on a DIY blog and I thought it would be cool to try it on a cookie. I tried out the technique night before using some fabric paint and scraps of paper and it was surprisingly easy. It is actually a lot easier to do than it looks – a little practice makes perfect as usual – and I think they look really impressive. I wanted to mix things up a little so I used another technique I’ve used in the past but this time made little hearts swirled into the cookie’s icing. I think it was a cool mixture of colors and designs and when they were all plated up it was so girly I loved it. Start off by making the sugar cookie dough, following my great-grandmother’s recipe, found HERE. I followed the baking directions found in the same post and just used heart shaped and round cutters instead of Christmas ones. Next I made 7 minute frosting by combining 4 cups sifted confectioner’s sugar, 5 tbsp meringue powder and a scant 1/2 cup of water in the bowl of an electric mixer and beating it for seven minutes. At this first step you want flooding consistency which means it need to be thick enough to not run right off the cookie but thin enough to flood together smoothly. I find it easiest to flood my cookies using candy melt bottles… I kept one bottle white, tinted one pink and one red. 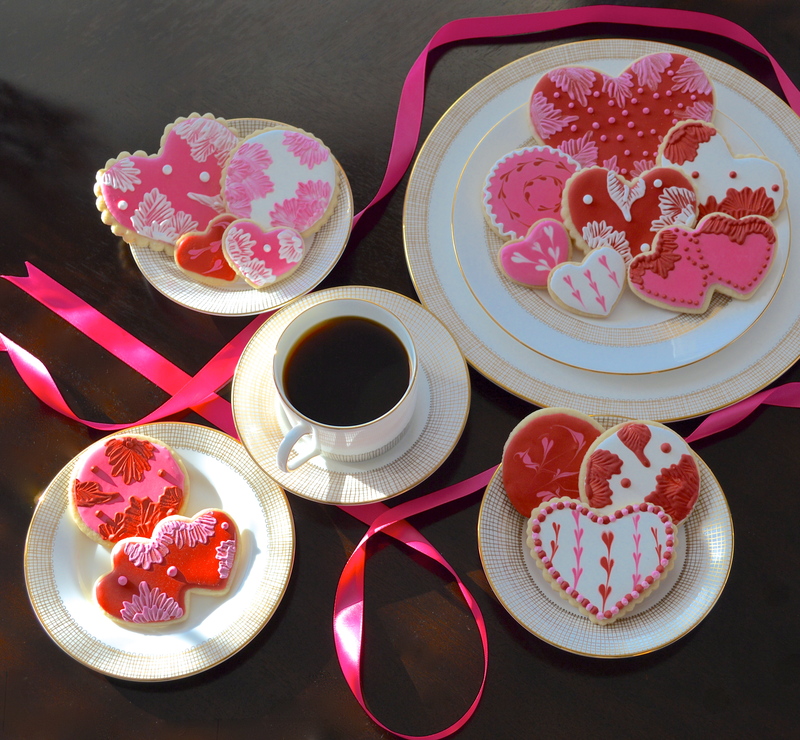 For the lines of hearts, flood your cookie in the base color and then make lines of dots with your accent color (1). Take a toothpick and pull down through the dots to make them into hearts (2). For the swirled hearts, just do random patterns of dots (3) then pull your toothpick one way and then another (4). For the circles of hearts, just do circles of dots and pull your toothpick in a circle one way and then the other for the other circle (5). 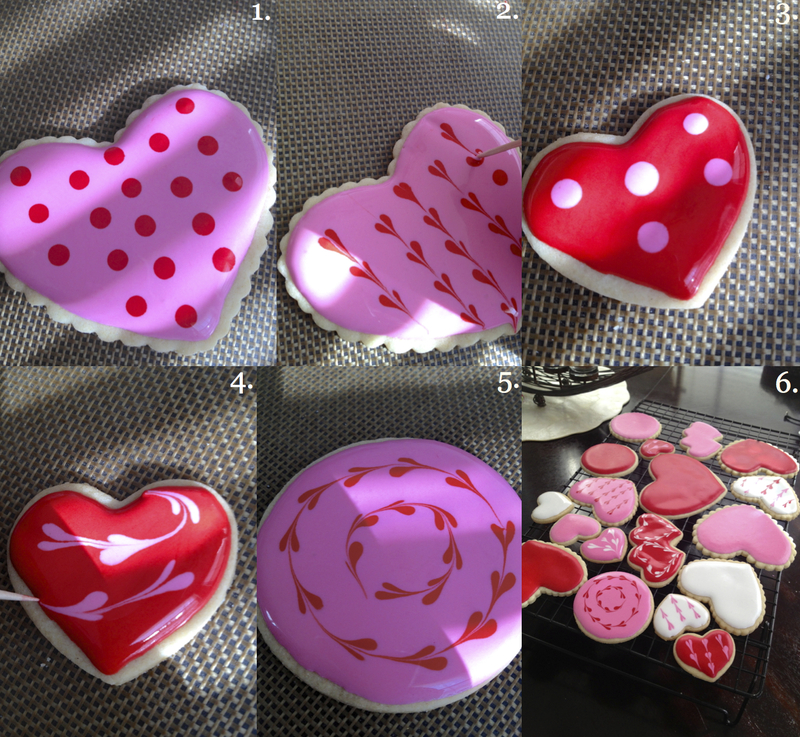 I did about half of my cookies with these pulled hearts and then left half just flooded in one color for the brush embroidery (6). You can use this same toothpick technique for lots of things including to make fireworks (see HERE), snow flocked trees (see HERE) and cool peppermint patterns for gingerbread houses (see HERE). I show below how I flood my cookies… first make an outline of the cookie and then work in small patches moving back and forth to fill it in (1). Once it’s totally flooded, drop it lightly on the table and bubbles will appear. Use a toothpick to pop them all (2), this will ensure that your cookies and completely smooth when they’re done. For the brush embroidery cookies, make sure you allow the flooded layer of icing to dry COMPLETELY before starting.I just put a damp paper towel over my mixing bowl with the remainder of the icing and wait a few hours. Once you’re ready to do this step, you want the icing to be much thicker than before, but still thin enough that you can pipe with it easily. 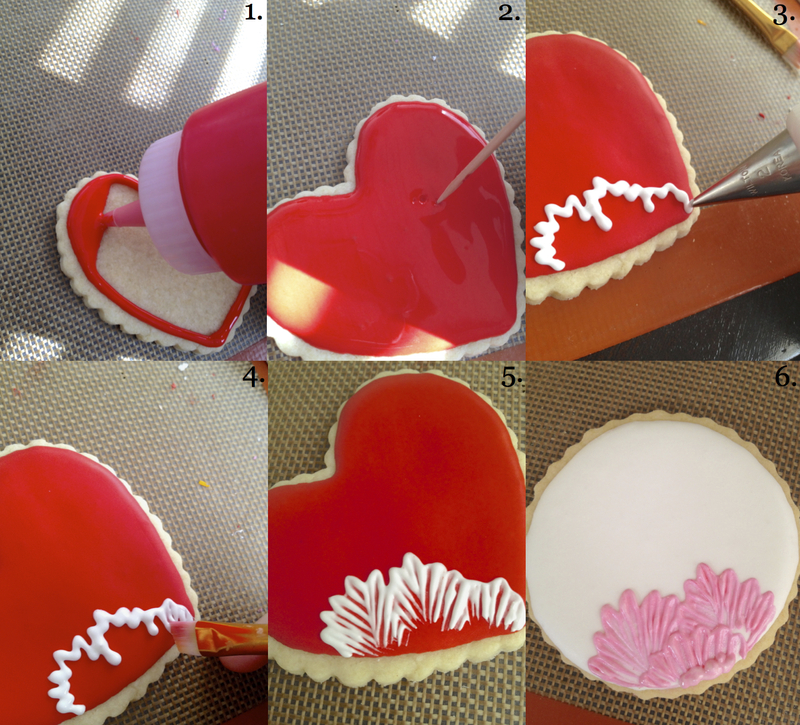 Fit a piping bag with a #2 top and the icing color of your choice and, starting at one edge of a cookie, pipe a few petals in a zig zag line (3). Take an angled rectangular tipped paint brush and start pulling the icing towards the edge of the cookie (4). Continue doing this following the shape of the petals (5). Pipe another layer of petals starting where your brush strokes end and repeat, then add a couple dots for the center of your flower (6). Continue this doing random patterns of flowers, leaves, etc. Use different colors and shapes, adding dots of icing for accents. Allow this to dry completely at room temperature before stacking and storing! These cookies look BEAUTIFUL! I saw these on my wp dashboard and immediately clicked! Great job they are absolutely stunning. Definitely the prettiest cookies I have ever seen! Thanks so much! I love that they caught your eye! Those cookies are perfection! Love the photos. Thank you! I got lucky the morning light in our kitchen hit it just right! Thanks! It takes lots of practice but it’s nice once I get the hang of it! Thanks, I wanted to try something different I was really happy with how they turned out! Reblogged this on S For Summer. Thank you! The icing comes from LOTS of practice lol now I can do it in my sleep but it used to be a struggle to get it just right! Thank you… and sounds like a perfect idea for mother’s day!! Thank you so much! I’m sure your girlfriend would LOVE you taking the time to do something so nice for her!